Abbe, André. Minaret of Jam. UNESCO, Afghanistan. Dupree, Nancy. 61-148-C. Dupree Collection, Williams Afghan Media Project, Williams College, Williamstown, MA. Dupree, Nancy. 61-162-C. Dupree Collection, Williams Afghan Media Project, Williams College, Williamstown, MA. Dupree, Nancy. 61-172. Dupree Collection, Williams Afghan Media Project, Williams College, Williamstown, MA. Dupree, Nancy. 61-217-C. Dupree Collection, Williams Afghan Media Project, Williams College, Williamstown, MA. Dupree, Nancy. 61-218-C. Dupree Collection, Williams Afghan Media Project, Williams College, Williamstown, MA. Dupree, Nancy. 61-220c. Dupree Collection, Williams Afghan Media Project, Williams College, Williamstown, MA. Dupree, Nancy. 61-226c. Dupree Collection, Williams Afghan Media Project, Williams College, Williamstown, MA. Dupree, Nancy. 61-227c. Dupree Collection, Williams Afghan Media Project, Williams College, Williamstown, MA. Dupree, Nancy. 61-228c. Dupree Collection, Williams Afghan Media Project, Williams College, Williamstown, MA. Dupree, Nancy. 62-108a. Dupree Collection, Williams Afghan Media Project, Williams College, Williamstown, MA. Dupree, Nancy. 63-172. Dupree Collection, Williams Afghan Media Project, Williams College, Williamstown, MA. Dupree, Nancy. A73-16. Dupree Collection, Williams Afghan Media Project, Williams College, Williamstown, MA. Mohammed, Baz. Ghazal, Urozgan Province. Sakata Music Collection, 1967. Podelco, Grant. "Afghanistan: Race To Preserve Historic Minarets Of Herat, Jam - Radio Free Europe / Radio Liberty © 2010." Radio Free Europe / Radio Liberty - Free Media in Unfree Societies. July 18, 2005. Accessed August 21, 2010. http://www.rferl.org/content/article/1059997.html. Stewart, Rory. The Places In Between. Orlando: Harcourt, 2006. The most surprising city in Afghanistan is probably the city of Jam, known mostly today by its minaret, but also by some ongoing excavations carried out in the last few years. The Minaret of Jam, which is the second highest in the world and 200 feet high, was lost, basically, to outsiders until the 1950s. That’s extraordinary, to not know about a world masterpiece. It’s now been named a UNESCO World Site. And we have to imagine it was a flourishing city when this minaret was built. Mountain cultures in Afghanistan tend to remain somewhat isolated from the world, concentrating their resources and ambition towards survival in the difficult terrain of their homeland. But from one isolated mountain province in Afghanistan, Ghor, a great empire descended to rule the lands of Central Asia. The chief Ghorid ruler, Ala-ud-din was one of the great warriors of ancient times. He earned the title of "the World Burner" by moving into and destroying the prime city of the Ghaznavids, Ghazni. The Ghorids ruled from their mountain capital deep in the Hindu Kush mountains in central Afghanistan, which is sometimes known as the lost city of the Turquoise Mountain. 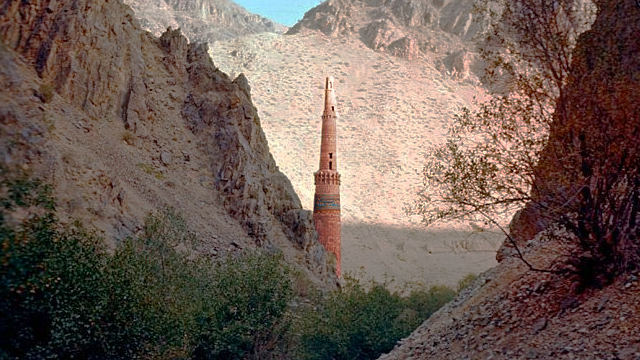 Of this fabled mountain city, only a single minaret remains, isolated in a lonely valley. Food, fodder, and all goods for the city must have been carried in, either over the snow passes we just crossed or, if the villagers were right, on a causeway of planks laid for five kilometers up the Hari Rud River. The valley walls were steep, prone to landslides, and difficult to build on. The lower houses must have received at most an hour’s sunlight a day. Ever since its rediscovery by a French scientist in 1957, the minaret of Jam has raised more questions than it has answered – not only about the Ghorids, but about the function of minarets themselves. We don’t know why minarets were built. Everyone says, “Minaret. Aha. Call to prayer.” It doesn’t seem like that’s a functional explanation, in the sense that why do you need a five-story building to call to prayer. You couldn’t hear your voice, if you were that tall. Furthermore, it seems that the earliest built mosques did not have minarets. In addition to its role as a religious structure, the minaret of Jam may have been built as a monument, landmark, or a watchtower. Minarets were probably multi-functional. Some of them marked passes, particularly in this part of the world, the passes through Afghanistan and into Pakistan or Iran. Some of them may have been symbols of Islam, simply made to show the presence of Islam. Some of them were surely used to mark congregational mosques. Today preservationists are fighting to save the minaret of Jam from not only the ravages of time and of the elements – but also of man. The very isolation of the Ghorid empire’s lost city today makes it inaccessible and dangerous for the archaeologists who want to excavate the site, and at the same time protects looters who smuggle antiques from the watchful eyes of the authorities. Of a fabled mountain city that was capitol to a great Ghorid Empire, only a minaret remains, isolated in a lonely valley.